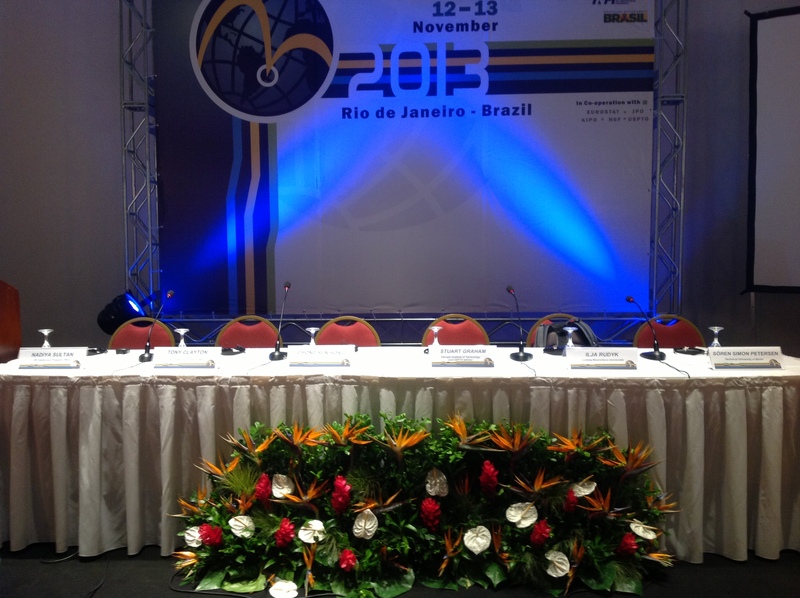 The 2013 conference “Patent Statistics for Decision Makers” in Rio de Janeiro Brazil was a fantastic opportunity for researchers and policy makers to share their knowledge about intellectual property (IP) and to address the IP world of tomorrow. Hosted by the OECD, EPO, WIPO, INPI, and the Brazilian government, the conference covered a broad range of topics: IP strategies, IP and economic performance, patents and human capital mobility, green patenting, patent systems, and the geography of innovation. The chair of Innovation Economics of the Technical University Berlin was represented by Sören Simon Petersen who presented the paper “Is Strategic Patenting still in Vogue? A reassessment of the motives to patent a decade after the patent peak” coauthored by Knut Blind and Julius Rauber. The study shows that strategic patenting motives have become less important over the last decade and that firms follow a more integrated patent strategy than ten years ago. Furthermore, other protection instruments such as utility patents have gained in importance over the last decade. Moreover, some of the other leading researchers in the field of patent research participated on the conference and presented their latest findings. David S. Abrams of the University of Pennsylvania discussed his findings regarding the relation of patent citations and patent value characterized by an inverted U-shape. Stefano Breschi of the University Bocconi presented a paper which examines the contribution to innovation by inventors of foreign origins which tend to be over-represented among high innovative inventors. Furthermore, Browyn H. Hall of the University of California showcased her work regarding the impact of patent commons on diffusion. Surprisingly, making patent accessible royalty-free has no impact on the diffusion of the patented technology. Additionally, Yann Ménière of MINES Paris Tech discussed in his presentation the transfer of standard relevant patents from 1997 till 2009 The corresponding research paper is coauthored by Tim Pohlmann from MINES Paris Tech and the Chair of Innovation Economics of the Technical University Berlin. Stuart Graham of the Georgia Institute of Technology presented a paper which indicates that small U.S. inventors prefer disclosure over secrecy in case of their most important inventions. Pierre-Alexandre Balland from the Utrecht University and the University of Eindhoven presented a study which showed that city characteristics drive the process of technological diversification as well as the technologies that are already present. Overall, the conference was a fantastic opportunity to discuss leading edge research and relevant questions in IP which should be addressed in the future. The broad range of topics has showed once again the deep economic impact of IP supporting its increasing role in economic research.